Join the Foxes for 14 exciting and fun-filled home games this summer! All weekday games start at 6:15 PM, while Saturday and Sunday games start at 5:15 PM --- you'll be home after the game to put the kids to bed at a decent hour! A 2019 Foxes ticket is good for admittance to any 2019 Foxes home game! Students with one or more "A" on their final spring 2019 report card, click HERE for information --- up to 6 tickets FREE! Season tickets (all 14 home games): $89 per set --- click here to order! Bring your beach chair or a blanket and sit in the cool grassy areas. Tickets for all Foxes home games are available at the "Ticket Table" at the field entrance. Fans may also pre-order tickets by sending an email --- we will leave your tickets at the "Ticket Table" to be picked up and paid for! All home games played at beautiful City Park Field, also known as "The Fox Den," in Fort Collins. For directions, click use the address of 211 South Bryan Avenue in Fort Collins in your GPS device (note: not our mailing address). Directions from I-25: Take Exit 269 (Colorado 14), heading west, which will put you on Mulberry. Drive west on Mulberry approximately 7 miles to Bryan. At Bryan, turn right (north) and continue on this road, which turns into City Park Drive, to the second stop sign, which is Bryan. Make a left on Bryan, and continue approximately one half mile to Oak. Turn left and go over the small bridge, and the field and parking area will be on your left. Sign up your children, your spouse, or your friends for the between-inning events listed below before you come to the game to guarantee they get to participate! Simply send us an email at least 24 hours before the game, and we'll sign you up! GREAT for your company picnic, team party, church group,or any other outing! NO WORRIES! The Foxes provide all the fun, and we can provide all the food --- no worrying about entertaining guests or cooking! AFFORDABLE! Discounted tickets are only $5 each ($3 each for children and seniors). FUN! 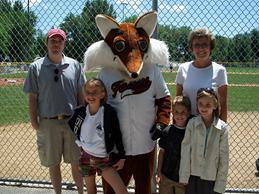 Come out and watch some exciting baseball with your Fort Collins Foxes! Click here for more group outing information, or contact the Foxes by email. SCOUT GROUPS --- click here for information on special outings for scout groups! Sponsor YOUR favorite non-profit group to attend a Foxes game! Click here for more information. Meet players in the dugout before the game and get autographs. A happy birthday wish over the PA system! First ball ceremony for the birthday boy or girl. Special greeting from Sly-der, the Foxes mascot! Take the field with Foxes players for the National Anthem. Option to sign up for a between-inning event --- your choice! Click here for more birthday party information, or contact the Foxes by email. Raise funds for YOUR group by selling Foxes tickets! Click here for more information. The Foxes promise you a family atmosphere at all games. This includes a no-alcohol policy and no obnoxious or profane fans. If any individuals cannot be part of our family atmosphere, they will be escorted out of the ballpark by security. Dogs are welcome at the Fox Den to come and cheer on their canine brethren (yes, foxes are part of the canine family). All dogs are admitted free when accompanied by their owner! A leash. Dogs must be leashed at all times. Plastic bags and other equipment needed to pick up and dispose of dog waste. Extra water for warm days. If your dog has a baseball shirt or other favorite costume or accessory, we encourage you to bring that as well. Physical address: 211 S. Bryan Avenue (note: NOT our mailing address). From I-25: Take Exit 269 (Colorado 14), heading west, which will put you on Mulberry. Drive west on Mulberry approximately 7 miles to Bryan. At Bryan, turn right (north) and continue on this road, which turns into City Park Drive, to the second stop sign, which is Bryan. Make a left on Bryan, and continue approximately one half mile to Oak. Turn left and go over the small bridge, and the field and parking area will be on your left. Click here for Mapquest map.